08:30. There has been torrential rain overnight. It just stopped a few minutes ago but according to the weather forecast rain is the order of the day and the wind will be stronger than recently. Jim confirmed that Trench B would NOT be discontinued as we reported yesterday. Instead, there appears to be features in both Trench B and Trench C which merit further investigation. They might indicated a feature such as a ditch. If they do then that may be of significance since no such features are show on any of the old maps of the area. The main work of the day will be focused on Trench A. All the skeletons will be further exposed and one will then be exhumed. 09:30. The rain started in earnest again at 09:00 but the delicate task of exposing the skeletons continues unabated. Why couldn't the dig have been carried out in July when the weather was beautiful? Niall and Jim make a tour of the site to review progress made so far and to decide the way ahead. Early visitor to the site will note the intensity of the digging work and the finer work to epose the skeletons but the purpose of the project is not just related to finding as many skeletons as possible. The team are interested in finding out about previous inhabitants of this area who were here long before Byron or the Londonderrys. The are interested in finding clues as to who they were, when they lived here and what kind of life they had. Was their community centred on a monastery or were they pagans. So far everything seems to point to a Christian settlement but nothing is being taken for granted. It has been decide to open another trench between Trench A and Trench D in an attempt to learn more accurately the extent of the cemetery. 09:50. The rain begins to pour once more. It looks set for the day. In Trench A they have been progressing steadily but the rain is too heavy to continue so its into the PortaCabin for the time being. The diagram below shows roughly the skeletons which have, so far, been uncovered in Trench A. There is a clear expectation of finding more. Click a skeleton to see a more detailed picture. Diagram showing position of skeletons in Trench A. 11:30. Still pouring down but the TV camera crew arrive from Tyne Tees Television. They interview Niall and Jim as the others work in Trench A. 12:30. The TV crew have left. The project will be featured on "Look North" around 6pm tonight. Throughout the afternoon. Jo and Jim spend a lot of time exposing skeleton A2. It is to be exhumed by the end of the afternoon. All the volunteer workers are keen to see this process but the rain is heavy and may stop it proceeding - Jim is determined that it will proceed. 16:00. Fiona has made an interesting find which Niall thinks could be valuable. 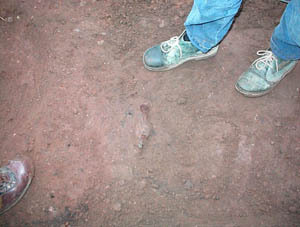 Together the work carefully to expose a metalic object which at first sight looked like a spear head but clearly isn't. The fact that it is in the same layer as the skeletons suggests that it is older than they are but nobody is taking up a strong position on it. Trench A. Close to skeleton B1. the ground. More on this item tomorrow. 16:10. Despite the conditions Jim and Jo will go ahead and exhume skeleton A2. It is not a simple matter of throwing a few bones into a plastic bag and hoping that you can remember where the go when you come to reconstruct the skeleton. 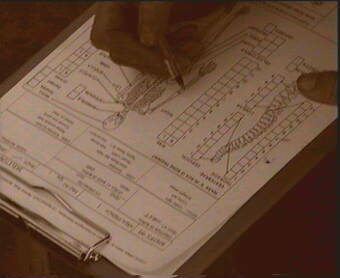 Both Jim and Jo in terrible conditions manage to complete prepared forms to indicate the way the body is lying and includes a whole host of detail. 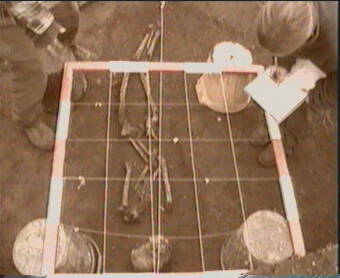 A grid is used to help with the drawing and measuring rods are laid out on the ground to indicate size and photographs are taken to record the scene of the exhumation. A string is stretched between head and feet to gain a more accurate idea of the height of the person. The use of buckets to support the grid may seem crude but the archaeologists are good workmen (and women) who know how to use simple tools to very good effect. The tasks being carried out in the pictures above may not seem too tedious but in cold and rainy weather many would have given up for the day. The example set by the professional archeologists is commendable nor were the volunteer team found lacking in stickability.